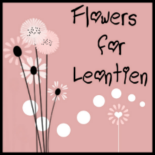 Sending some love to Leontien! Thank you so much for these beautiful flowers AND those boots!!!! I love them! Big hugs from up North!